There are many contrasting opinions if it is best to run at home or outdoors. Outside, you can experience a beautiful panorama, beautiful weather, and the breeze of the wind. Undoubtedly, it is more pleasant to work outdoors, but there are also benefits of training indoors. "A little rain has never hurt anyone" - but depending on where you live, weather conditions can be a huge problem for daily workouts. Snow or ice can cause accidents during training, and too much heat can lead to dehydration and fatigue. In some circumstances, even air pollution can be dangerous. No matter the city where you live, going out alone can be dangerous. Most runners tend to get out early in the morning or late at night. And in the winter months, it’s light quite late in the morning and gets dark very early in the afternoon. Why risk the safety factor? Dehydration can become a serious problem, especially when doing sports outdoors without having a bit of water with you. Running with a bottle of water is not quite pleasant. Treadmill Benefit: Most standard treadmills come with cup holders. A lot of times, you go out without mapping a path, or your smartphone has a low battery and you cannot use a running app to track progress. The advantage of the treadmill: Many treadmills have programs to help customize and create your own workouts. Though land can vary from place to place, it is certain: it is unpredictable what can be found outside. From smooth concrete, to sidewalks, to brick, to grass, to dirt. Some of these surfaces can strain your legs, especially the joints. 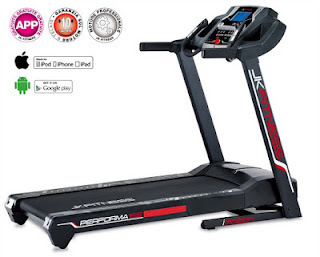 Treadmill Benefit: The tool provides the right texture and cushioning system and helps the muscles and joints. Setting a target heart rate is the best way to achieve results, whether you want to work on fat burning or whether you want to have a cardiocirculatory training aimed at enhancing the heart-lung system, if you want to follow directions of a physician in rehabilitation. HRC programs on treadmills allow you to set a target frequency and the treadmill will change speed and gradient to keep you as close to the target as possible. The results? An increase of 24% of how many calories you burn in a workout and a strong reduction in the risk of overtaking with heartbeats or vice versa, keeps a rhythm too low and therefore irrelevant. Sometimes it is quite difficult to get out of bed in the morning, change and go out for a workout. Benefit from the treadmill: With a treadmill within arm’s reach, there are no more excuses!